Contrary to popular belief, aphids are not just sap-sucking, plant-destroying enemies of agriculture. In fact, these pests are genetic pioneers that evolved two unique traits, according to a study that appeared in the April 30 issue of the journal Science. First, aphids are, so far, the only animal known to produce essential pigments known as carotenoids. The aphid's pigment-producing ability is unique to the animal kingdom. Other animals, including humans, that need carotenoids cannot produce these essentials themselves; instead, they must obtain carotenoids from food. Why are carotenoids needed by many plants and animals? Because they provide vital support to varied functions, ranging from promoting immunity to reducing cell damage and providing color to fruits and vegetables. For example, carotenoids give tomatoes their red color and flamingoes their pink color. Carotenoids also determine whether aphids are red or green--a color distinction that influences their vulnerability to predators and other threats. As for the second unique trait, aphids probably acquired their carotenoid-producing ability through a rare, and perhaps unique, process: millions of years ago, aphids apparently "snatched" carotenoid-producing genes from a carotenoid-producing member of the fungi kingdom, and then snapped those snatched genes into their own genetic code. Gene transfer between organisms is not itself a rare phenomenon. 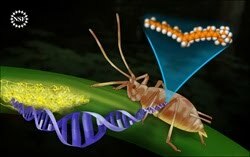 However, the fungi-to-aphid gene transfer is the only known gene transfer between members of the fungi kingdom and animal kingdom--which are so evolutionarily distant from one another that it was long thought that never the twain would genetically meet. But by busting through kingdom barriers, aphids gained something akin to a "genetic magic wand" that empowered them to produce their own carotenoids. They were thereby freed of the need to scavenge for carotenoid-yielding foods. The result: one less chore on the aphid's "to do" list, and a new self-sufficiency for these insects. No one knows what compelled genes to jump from fungi to aphids. But "the transferred fungi genes may have originated from a closely associated fungus, such as one of the fungi that causes diseases in aphids," says Nancy Moran of the University of Arizona, the lead author of the Science paper. "Because the carotenoid-producing genes were the only fungus-related genes that we found in the aphid genes, we think that the fungi-to-aphid transfer was an extremely rare event." "This is a very big discovery," says Matt Kane of the National Science Foundation. "By recognizing the horizontal transfer of nutritionally important carotenoid genes, Nancy Moran and her colleagues are the first to discover that gene transfer can occur between very distantly related groups of higher, multi-cellular organisms such as fungi and insects." The foundation for the discovery of the fungi-to-aphid gene transfer was laid when a research team that included Moran constructed the first map of the entire genetic code of aphids. Then, when follow-up studies of the aphid's genetic map were conducted by a different research led by Moran, the presence of carotenoid-producing genes was discovered. Because a few cases of bacterium-to-animal gene transfer are known and because aphids have close associations with bacterial symbionts, bacteria were initially considered a more likely suspect for genetic swapping with aphids than were the more genetically complex fungi. But after identifying signature similarities between the sequences and arrangements of the aphid and fungi carotenoid-producing genes, Moran's team was able to eliminate bacteria, as well as laboratory contamination, as potential sources for the aphids' carotenoid-producing genes.